Off to the UK and the Manchester Symposium! We’re off on our first trip to the United Kingdom! Our itinerary includes London, Manchester and Bath, England, and several days in northern Wales. I keep hearing that summer in those parts is not very different from summer in these parts – mostly moderate in temperature but possibly wet and cool – so it’ll be just like home (well, except for the Edwardian castles, ancient Roman baths and warm beer). The main event on my itinerary is, of course, the 7th International Urban Sketchers Symposium in Manchester, where I’ll be serving as one of four correspondents to report on the event. I’m mostly thrilled and excited, but I’m also a bit anxious and nervous. 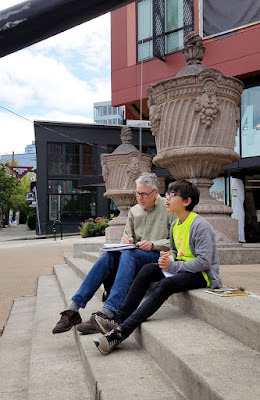 With two symposiums under my belt, I’m familiar with the intensity of being immersed in urban sketching for three-and-a-half solid days. I already know the fun of becoming reacquainted with worldwide sketchers and meeting ones I’ve known only online. The challenge of reporting on all of that, however, will be a very new experience. I’ve practiced the mechanics of mobile blogging. My correspondents team and I have set up a Whatsapp group on our phones to facilitate communication. Heck, we even have a spreadsheet color-coded to the workshop map so that we can cover as many activities as possible. I guess I’m as ready as I’ll ever be! Wish me luck! 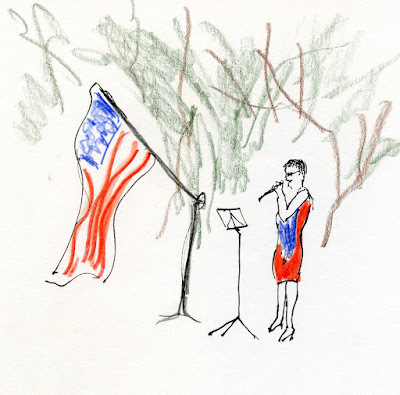 I won’t be blogging here while I’m gone, but on July 27 – 30, please check out the daily posts of the correspondents team on the Urban Sketchers Symposium blog. We’ll be sharing links to our posts on the Manchester Symposium Facebook page. You can keep up with the rest of my UK adventures on Instagram and Flickr. 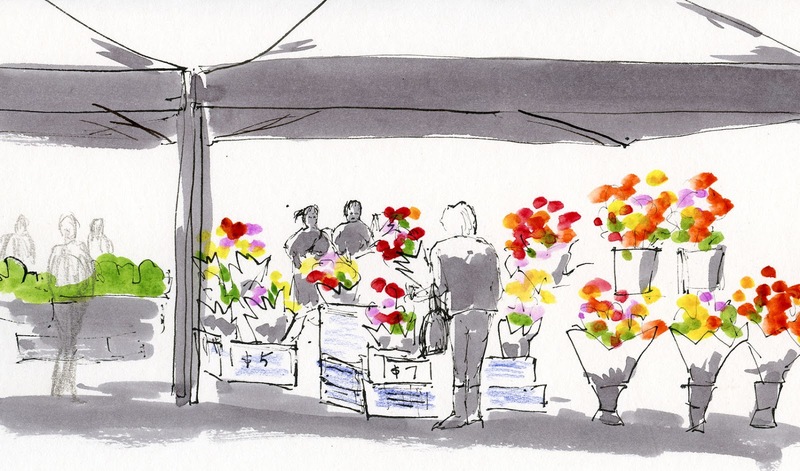 And you can also search for the hashtag ‪#‎uskmanchester2016 on social media to find sketches and photos by all participants. Two distinctive and strikingly different churches dominate the South Lake Union area’s historic Cascade neighborhood. The most eye-catching is St. Spiridon Russian Orthodox Cathedral, with its deep blue onion domes. 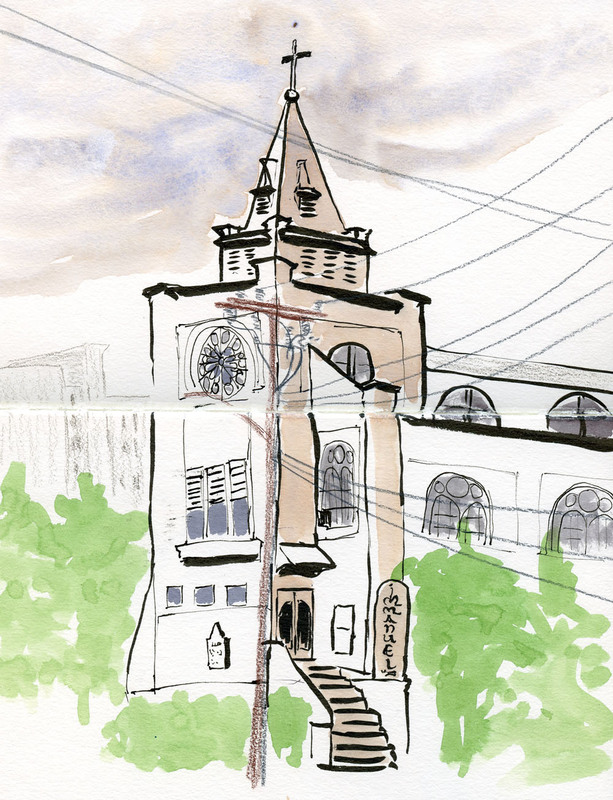 Since I’d sketched St. Spiridon about a year ago (and since I should have been home packing my bag instead of sketching with Urban Sketchers Seattle this morning and was short on time), I decided to focus on the second church: Immanuel Lutheran. Completed in 1912, the church has been on the historic register since 1982. Although it doesn’t look like anything I’ve sketched in Europe, the round and arched windows evoke the same architectural details I saw on Gothic buildings in Spain and Germany. It’s exactly the kind of building that makes me freeze with the deer-in-the-headlights look if I try to go at it with a fine point pen. But with only an hour to sketch, I immediately pulled out my brush pen to hit it as hard and fast as possible. It’s probably a good strategy even when I can be more leisurely. 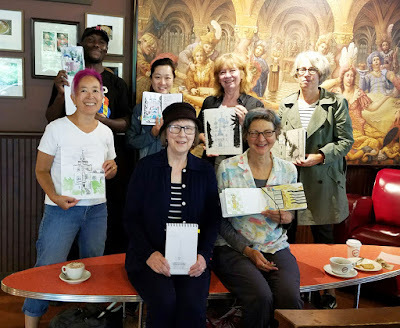 The rain earlier in the morning may have kept some sketchers away, but the seven of us who showed up shared sketches afterwards at Espresso Vivace. Those blue onion domes captured a lot of attention! 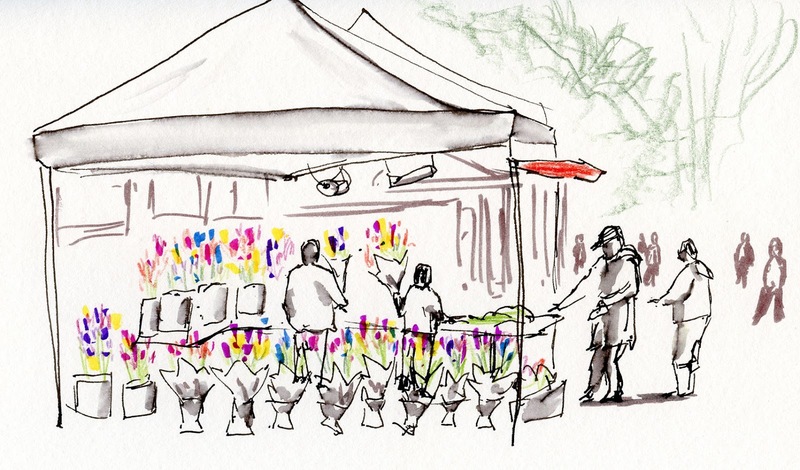 The Queen Anne neighborhood’s weekly farmers market always brings in terrific food trucks and plenty of community seating. Last week when the weather finally started feeling like summer, we picked up our produce there in the late afternoon and then stayed for dinner. After strolling past all the food trucks to sniff out my options, I chose Mystery Bay Seafood Catering, where I got the best grilled salmon sandwich I have ever had! As a Pacific Northwest native, I’ve eaten a lot of delicious salmon in my life, so my standards are fairly high, and this sandwich was amazing. 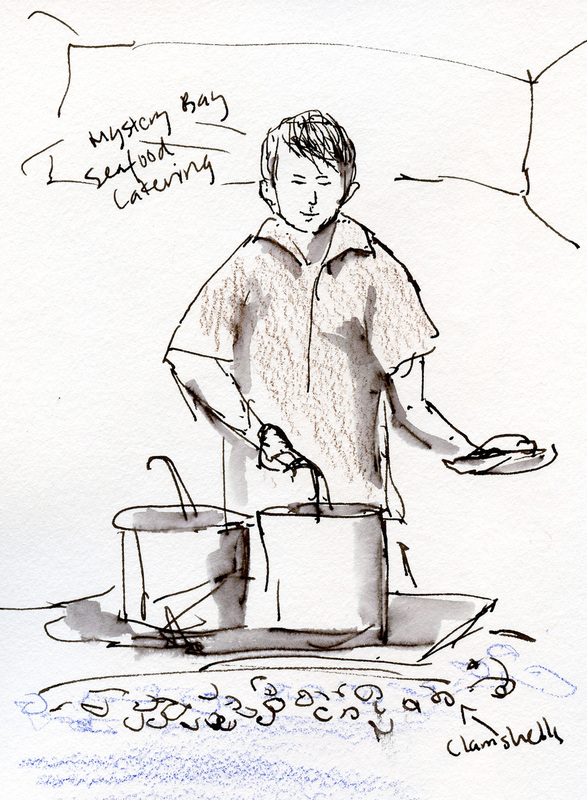 The poor guy at the booth was all alone, but he moved briskly and efficiently among the grills and chowder pots to keep his line of hungry patrons happy. After dinner we stopped for ice cream at another food truck. 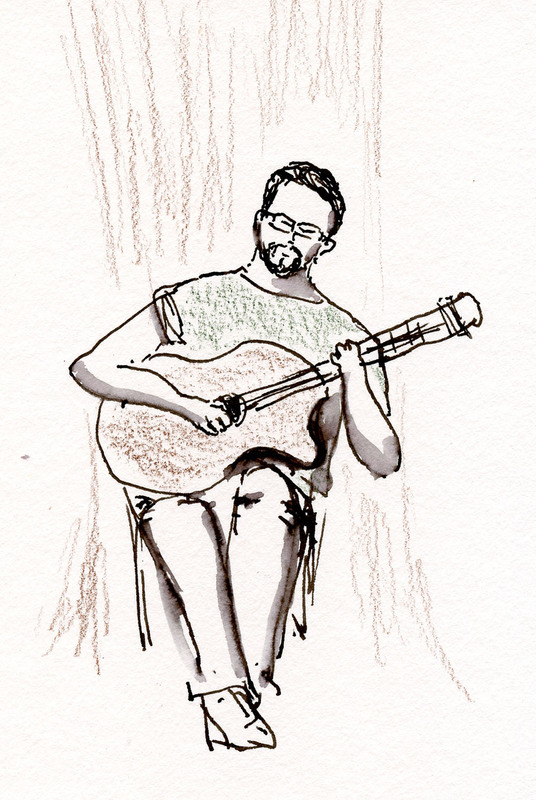 I found seats directly across from a classical guitarist who gave us delightful music to scarf our ice cream down by. Ahhhh. 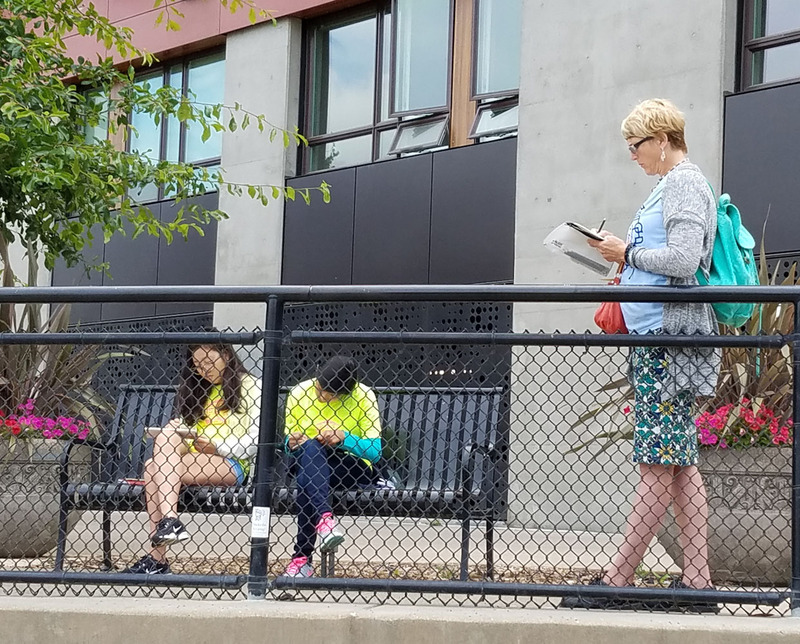 I know I say this every year, but it’s the truth: Summer in Seattle doesn’t get any better than this! And it’s short and precious. I hope you’re enjoying your summer, too. For the past couple of years, my favorite water-soluble colored pencils have been Caran d’Ache Museum Aquarelle pencils. Probably the Mercedes of colored pencils, they cost a pretty penny, but I take advantage of open stock suppliers to buy only the colors I use. Although the Museum color range isn’t as wide as Faber-Castell’s Albrecht Durer or Caran d’Ache’s mid-range pencil, Supracolor, that range includes an irresistible variety of earthy tones handy for urban sketching and other hues that closely align with watercolor paint pigments. The main reason I like the Museum line, however, is that they are the softest colored pencils I’ve ever used. They can be applied effortlessly and dissolve completely when activated with a little water and without scrubbing. An assortment of 18 Fancolor pencils. 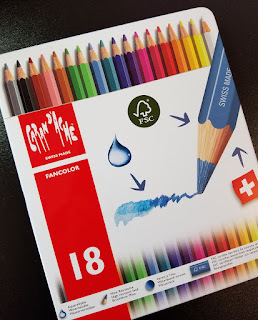 Just recently, a new (to me; I don’t think the product is new) line from Caran d’Ache came to my attention: Fancolor water-soluble colored pencils. Unlike the Museum and Supracolor lines, which are in the “professional and artist” collection, the Fancolor pencils are in the “hobby” section, which is probably the same as other manufacturers’ “student” lines. 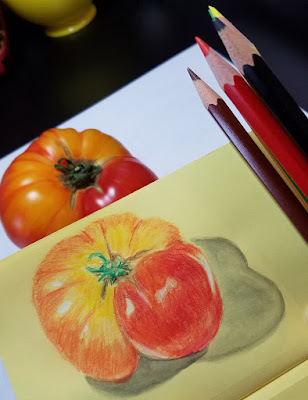 When I’ve tried “student” grade colored pencils, especially inexpensive ones, I’ve found most to be dry, hard and scratchy in application, and water only partially dissolves the pigment. 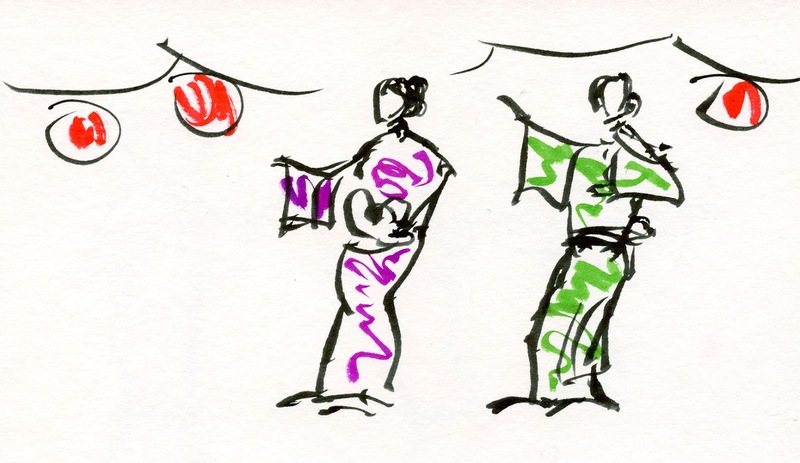 (One example is Faber-Castell’s Art Grip Aquarelle line.) I figured that the Fancolors might be like this, but colored pencil junkie that I am, I couldn’t resist getting a box of 18, just to see what they’re like. I kept my expectations low. To my surprise, when applied, the Fancolors feel almost as soft and creamy as Museum pencils (if you blindfolded me, I’d probably have a hard time knowing the difference). 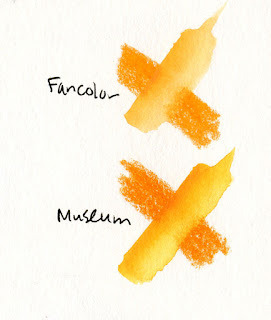 When activated with water, the hues aren’t quite as rich as Museum pencils (which undoubtedly have more pigment), but they still dissolve as fully and quickly. And the colors blend just as easily. 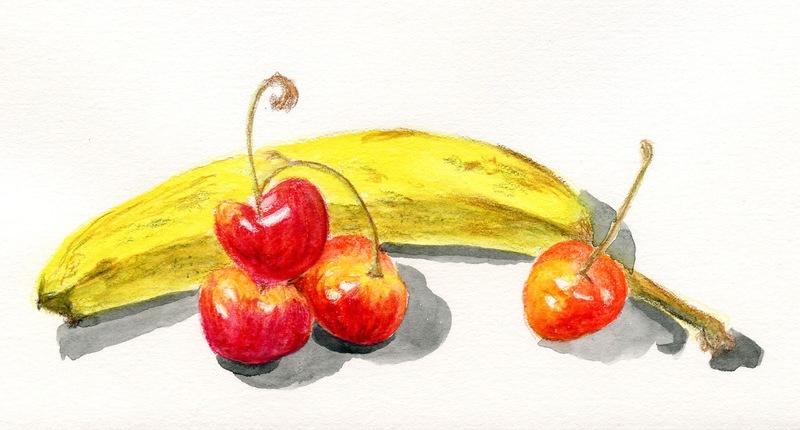 In the sketches shown here, the one of the banana and cherries (top) was done on Stillman & Birn Alpha paper, which has a good tooth to it. I’ve found it to be an ideal surface for water-soluble colored pencils, because the tooth grabs the pigment easily when applied in gradual layers, and it holds up well if water is applied. 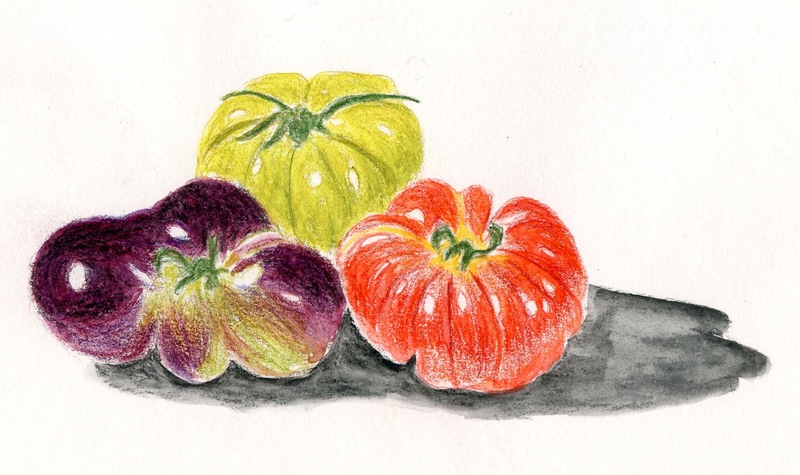 For comparison, I’m showing a still life of three heirloom tomatoes that you saw last month (at right), which was done with Museum pencils, also on S&B Alpha. The sketch of the single heirloom (bottom of page) was done in a yellow Field Notes notebook. (Granted, that paper is probably not intended for water-soluble colored pencils, but it held up well to both the bright colors and water.) The Field Notes paper is a lot smoother than S&B Alpha, and I think colored pencils really need a little more tooth for better coverage. Still, the Fancolors didn’t do bad at all, and the white pencil included in the box of 18 helped bring out the highlights that didn’t quite pop on yellow paper as they did on white Alpha. Despite how much I love Museum pencils, a pet peeve of mine is that their diameter is just slightly larger than conventional pencils, and I’ve had a heck of a time finding a portable sharpener that can accommodate them. (I took my search all the way to Paris and Tokyo with mediocre results. Right now, the smaller hole of this KUM sharpener seems to be working best.) So I was delighted to find that Fancolor pencils are the same diameter as conventional pencils. I can stick them into my electric pencil sharpener, and they come out with deadly sharp points, just as I like them. And yet they don’t crumble! On the downside: If you care about archival materials, I’m assuming that the Fancolors are not. That’s typically a distinguishing trait between “professional/artist” and “hobby/student,” and Caran d’Ache tells me that Museum pencils’ lightfast colors will last longer than I will. (However, I couldn’t find anything about whether Fancolors are archival in Caran d’Ache’s product information.) In addition, the Fancolor range is relatively narrow (the largest assortment comes with 40), and the hues tend toward crayon-bright. 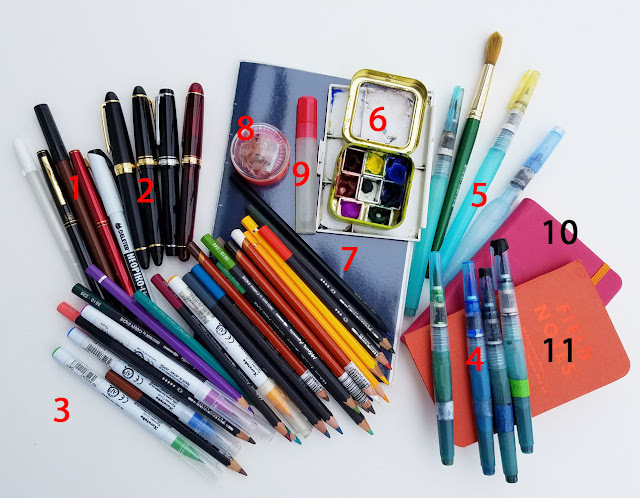 But how’s this for a colored pencil strategy: Get a budget-priced box of 18 or 40 Fancolors for the basics, then fill in with individual colors of high-priced Museums or mid-range Albrecht Durers or Supracolors for the more subtle or rich, earthy hues. At less than half the price of Museums (and a third less than Supracolors), the Fancolors offer a lot of bang for the buck. My UK and Manchester Symposium sketch kit bag dump! Every time we travel internationally, the time and attention I have to give to preparing depends on the country we’re visiting, the time of year, how long we’ll be there, and many other factors. For example, Brazil required a visa with a tedious and lengthy application process, but packing clothes was easy because I knew the weather would be mostly warm. I’ve been to Japan four times now, so familiarity makes packing for that country relatively fast. But boning up on my rusty Japanese reading skills with a deck of flash cards always takes longer than I think it should! It took us more time than expected to plan our itinerary for France, despite being a small country geographically, simply because there were so many places we wanted to see. coming with me to the UK. 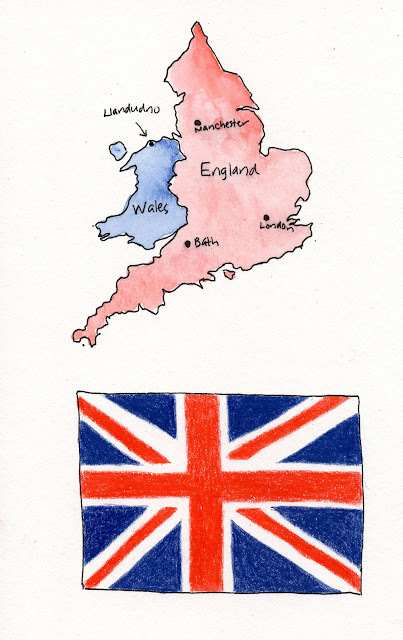 Although prepping for our upcoming trip to the UK seems like it should be a snap – after all, for the first time, we don’t have to worry about language issues – logistically, it’s not the easiest country to visit, at least without a car. But one part of my prep has been the easiest ever, and that’s my sketch kit! 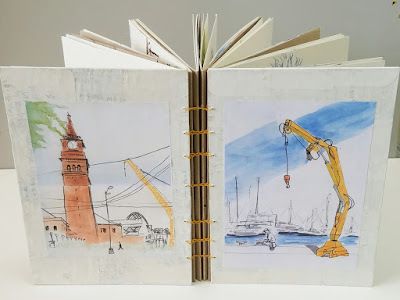 Three years ago when I was getting ready for my first Urban Sketchers Symposium in Barcelona, I had to write two blog posts just on my kit prep – one for watercolors, and one for everything else. As a newbie to both symposiums and sketching in general (I’d been at it for less than two years at that point), I didn’t know what to expect, and I didn’t have enough experience to have a solid kit in place. 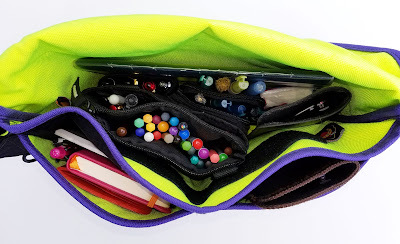 I spent many hours wringing my hands over what to bring, how much, putting things into my bag, taking them out, and putting them back in again. 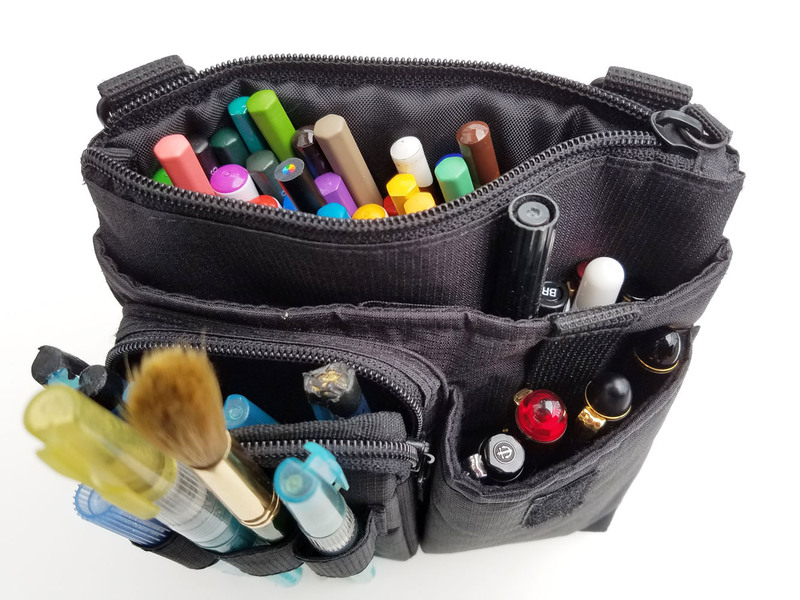 With each successive travel experience my sketch kit prep got easier. By 2014 as I prepped for the Paraty symposium, the contents of my bag weren’t an issue so much as the bag itself. 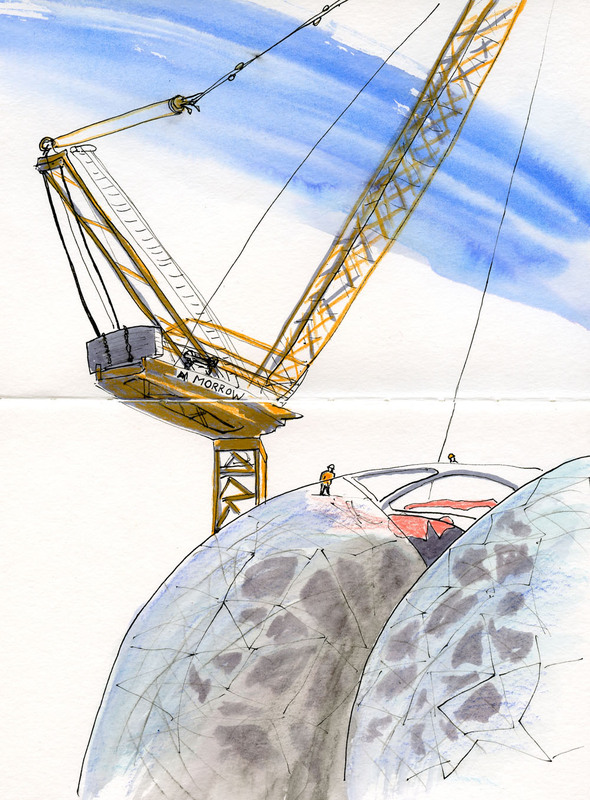 By the following spring, I yawned through my France kit prep – just business as usual. 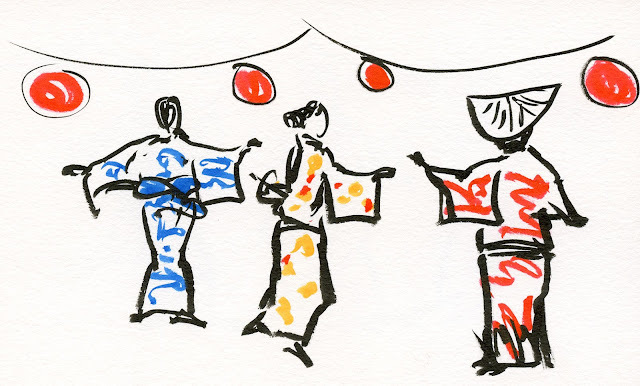 For Japan in the fall, I almost didn’t blog about the prep at all because I had very little news to report. Again, not much is new about my kit for this upcoming trip. 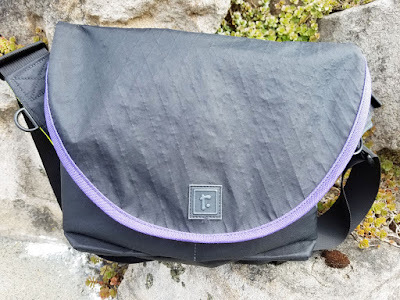 Because rain is a distinct possibility, especially in London and Manchester, I’m switching to my waterproof Rickshaw Bagworks Zero messenger bag (which I decided to purchase after my fabric Rickshaw got drenched in Kyoto). I really love the fact that its design is identical to my usual purple Rickshaw Zero; I won’t have to learn a new pocket arrangement. I do have a couple of new additions: Although I’ll still be using my usual hand-stitched sketchbook signatures for my “normal” sketches, I’m bringing a spiral-bound, hardcover Stillman & Birn Beta sketchbook in the 10-by-7-inch size specifically for symposium sketches. I’ll be one of four correspondents commissioned to report on symposium activities for the three days. 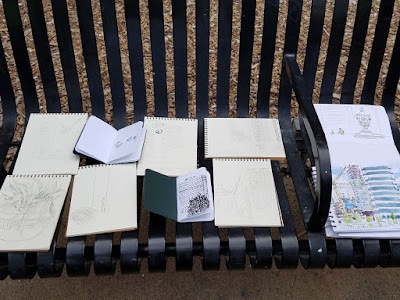 I wanted to keep those reportage sketches separate from my personal travel sketches so that I could easily detach any that I want to donate to the annual Urban Sketchers silent auction at the symposium’s closing. Unfortunately, that book doesn’t fit in my Rickshaw, so it’s going to have to go in my supplemental tote bag for the few days of the symposium. 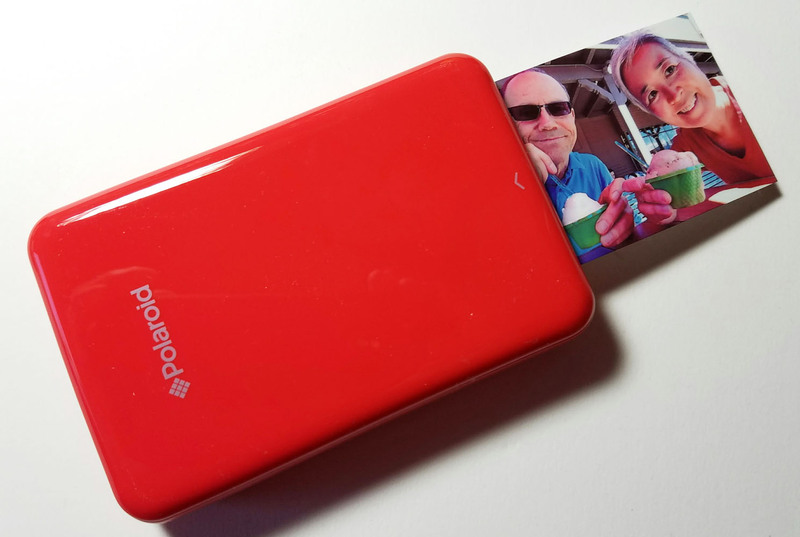 Poloroid Zip printer for travel journal photos. 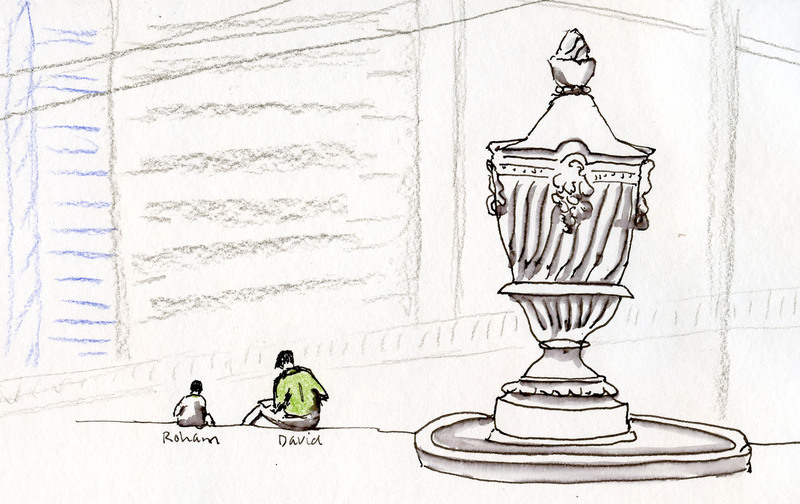 The second new addition doesn’t have anything to do with sketching, but it’s more about my general travel journal. Before I started sketching, I used to bring along a small Polaroid PoGo printer. 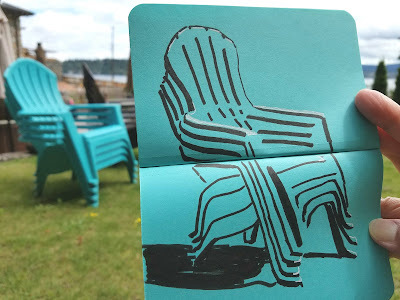 At the end of the day when we were relaxing in our hotel room, I’d print a few of my favorite photos on the self-adhesive Zink paper and stick them right into the pages of my journal where I wrote about experiences, observations and other travel thoughts. 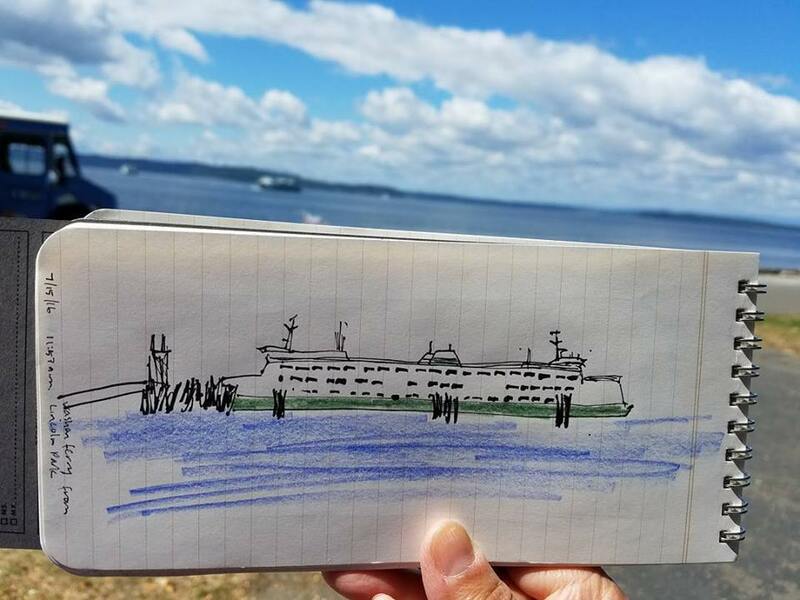 When I first began sketching, I left the PoGo behind because I was a little worried that I’d get lazy and go back to sticking in photos instead of sketching. 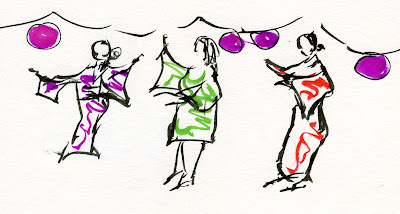 By the time I realized that risk was nil (although I may have my share of issues, it’s probably apparent that getting lazy about sketching is not one of them! ), the PoGo had died. The last couple of trips, however, I’ve missed my PoGo. 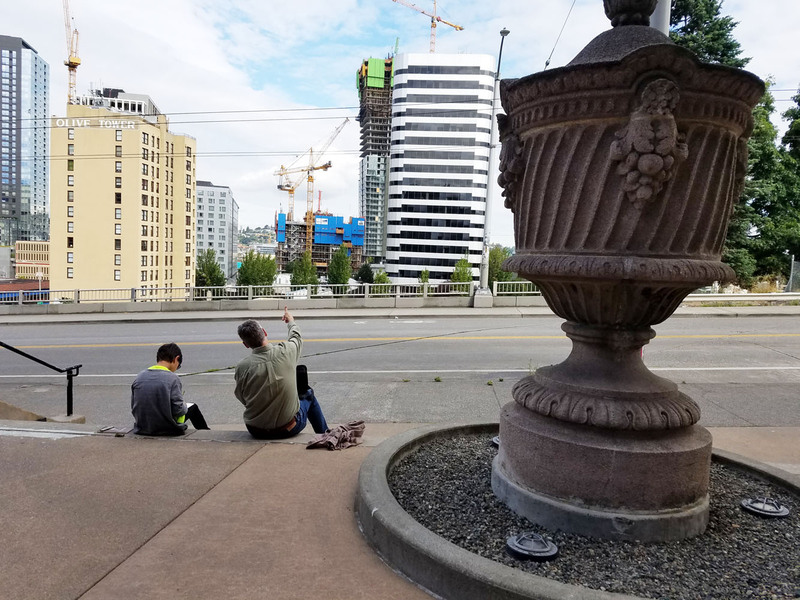 When I thought about the types of photos I’d glue into my journal, I realized they wouldn’t replace sketches; they were more like selfies or strange signage I didn’t want to forget. There’s a place for an instant printer even in a sketcher’s journal. On Amazon Prime day, a friend let me know that the Polaroid Zip printer was almost half price; I jumped on it! It’s even smaller and lighter than my old PoGo. So that’s it; nothing very exciting to report. But don’t you like that photo of my bag dump? My May - July sketchbook is bound. 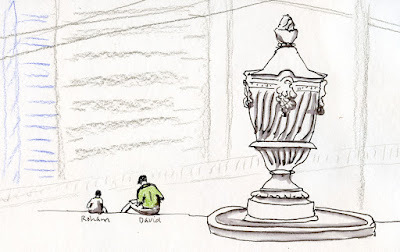 Often it seems that my favorite sketches are those that I’ve done when I’m out sketching on my own instead of with Urban Sketchers. Maybe it’s that I’ve chosen the locations myself, so I already have more interest in the subject matter. Or maybe it’s just that at group outings I spend more time socializing and less time focusing on a composition. 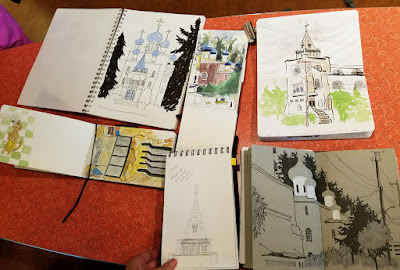 As I picked out the sketches to put on my newly bound sketchbook’s covers, however, I realized that two of my favorites during this period were both from USk outings. One was done on a drizzly May morning at King Street Station. The other was made at Fishermen’s Terminal when USk Seattle celebrated its seventh anniversary. In other sketchbook news, I know just last week I said I was going to fill the Stillman & Birn Alpha softcover book that I started that day. I lied. As soon as I put the sketches from that day on my scanner, I remembered that the Alpha paper is less opaque than I like, and I’ve been spoiled by the 140-pound Canson XL I’ve been using the past couple years. I switched immediately to my softcover Beta – and remembered how much I enjoyed that paper back when I was using it more regularly. This one I will definitely fill. For the second year, Urban Sketchers Seattle took part in the Georgetown Garden Walk, an annual event that culminates with music and art in Oxbow Park. 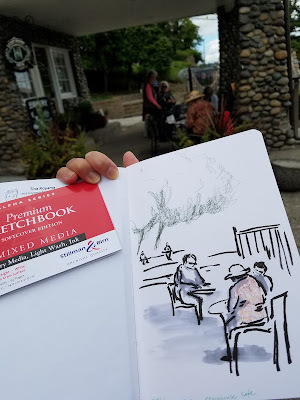 While I enjoy gardens as much as the next sketcher, I knew from last year that they would be crowded and difficult to sketch in, so today I went directly to the park instead. 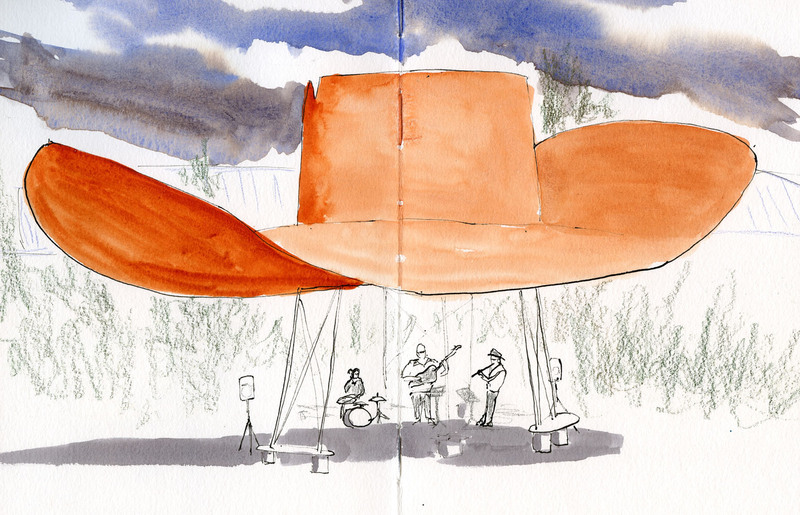 Like last year, I couldn’t resist another sketch of at least the hat part of the legendary and historic Hat ‘n’ Boots. Even better, a jazz band was performing under the hat (and unlike my lunchtime experience yesterday, this band was fantastic)! Are They Still Tuning Up? 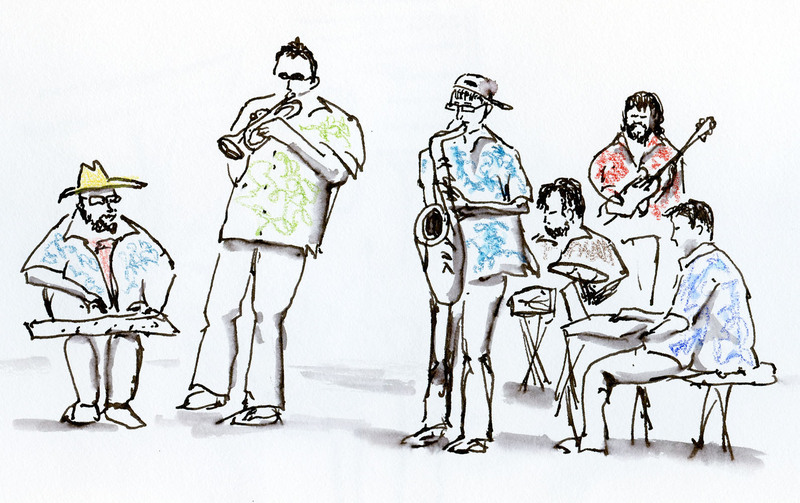 When I go to farmers markets and other free venues to sketch buskers and other musicians, I don’t expect or need the music to be good; my entertainment comes from sketching them. 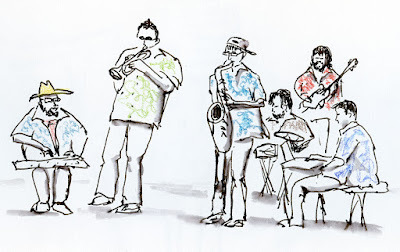 That said, the jazz band that performed this noon at the Shoreline Farmers Market was probably the worst we have ever heard. 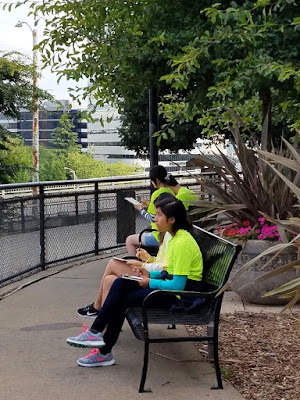 As we ate our lunches from the food trucks, we kept asking each other, “Are they still tuning up? 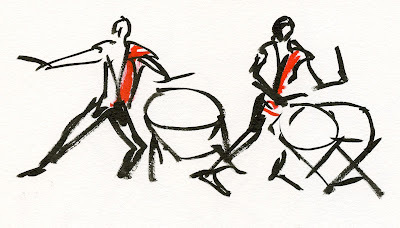 Or have they started?” They sounded like they had never played together before (and, we can only hope, will never again)! Still, who am I to criticize? 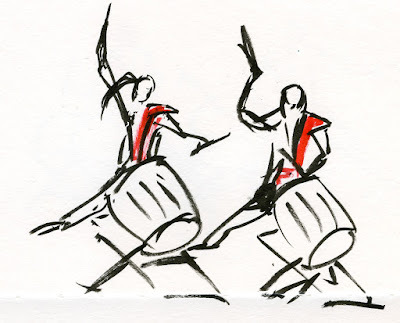 My entertainment comes from the sketching, and that part was still fun. A tribute is being made to the memory of Florian Afflerbach for the Urban Sketchers Symposium in Manchester: a wall of sketches of cars and other vehicles. Although I have sketched several classic cars at the Greenwood Car Show, I wanted to make a new sketch in his well-known fisheye style. I wasn't sure if I'd see a vintage vehicle in time for the symposium, but somehow these things seem to turn up serendipitously. 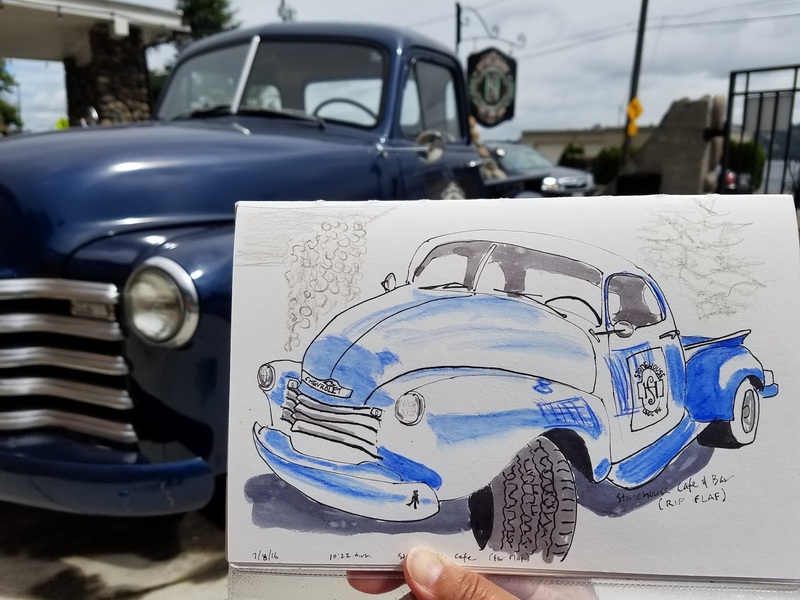 Sure enough, I met with Urban Sketchers Seattle this morning at the Stonehouse Cafe (where we sketched for the first time last fall), and parked in front was the owner's beautifully restored '53 Chevy truck. And how's this for more serendipity? I don't usually carry a blue Field Notes notebook in my bag, but this morning I grabbed it on sheer whim as I was walking out the door. In the back of the restaurant near the gazebo was a stack of Adirondack chairs -- in the very same shade of blue! Here's my second try at blogging remotely. I've simplified the process a bit by giving up on the CamScanner app, which seemed like such a good idea. Unfortunately, images couldn't be resized, and the default size was very small. 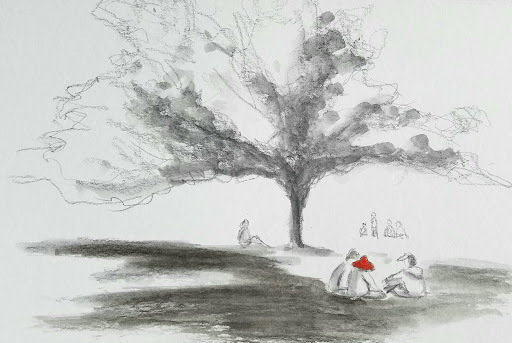 For this sketch of picnickers at Meridian Park, I simply took a photo of the sketch. I got several good suggestions from readers about dictating into the phone instead of writing, but my brain is wired so directly to my keyboard that I realized I couldn't think and dictate at the same time. ;-) But this little inexpensive and portable Anker keyboard speeds up phone blogging immensely! I think I'm good. Ready or not, Manchester symposium, here I come (in three weeks exactly!). 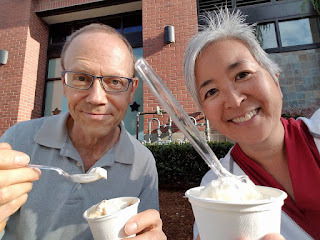 Edited: Now that I'm in the Blogger editor from my desktop, I see that the image still can't be resized -- so the problem is not with CamScanner; it's with Blogaway (the third-party Blogger app I am using instead of the buggy Blogger app). Arggh. Back to the drawing board. After strawberries, my favorite early-summer fruit is cherries. Rainiers have the most intense flavor and are more fun to color – that lovely blush of red-orange on yellow. Bings, however, are an indescribable, near-black shade of red that required four colored pencils to try to capture, and I still didn’t get it dark enough. 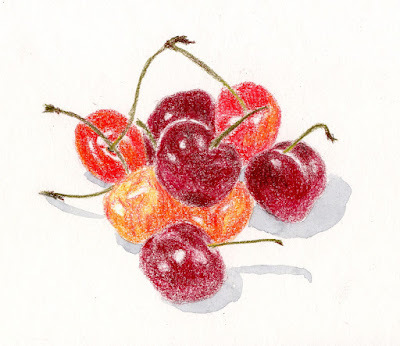 So shiny and sensuous, cherries were the only sketchable bright spot on this gloomy, wet afternoon. The man next door is eccentric, nosy, crabby and prone to annoying behavior. I won’t go on and on (because I certainly could), but to give you just one example: Whenever our other neighbor’s Labrador starts barking, he goes out to the yard, stands by the fence and yells, “Shut up! Shut up! Shut up!” which only makes the dog bark more. His yelling is far more annoying than the dog’s barking. 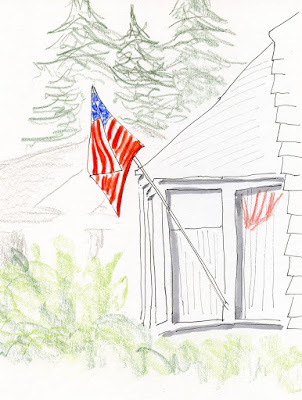 The man next door is also the most patriotic person on our street, if patriotism is demonstrated by display of the U.S. flag. 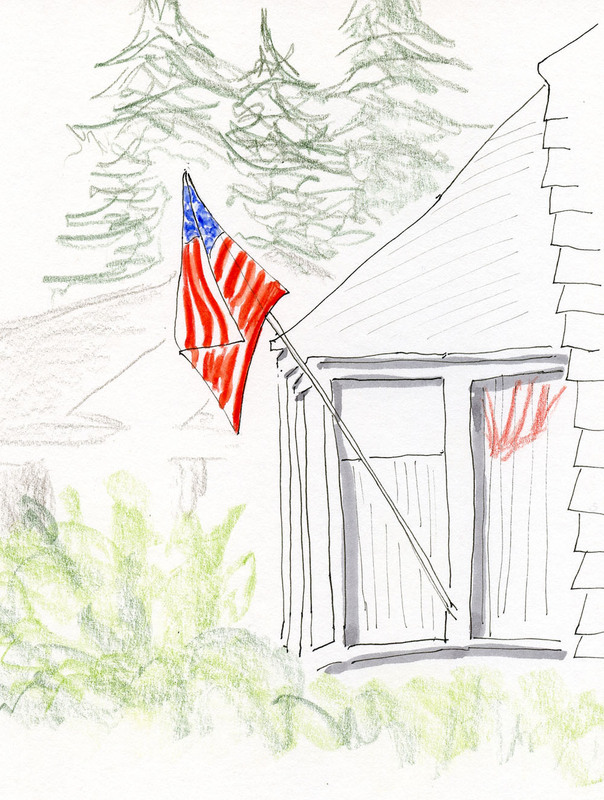 Every Memorial Day, Flag Day, Veteran’s Day and certainly Independence Day, he puts his flag up in front of his house, without fail. He has done so for every flag-appropriate holiday in the 28 years that we’ve been neighbors. Yesterday we had visitors in town, so we got to play tourists. One of our favorite places to take people who haven’t seen Seattle before is the Ballard Locks. 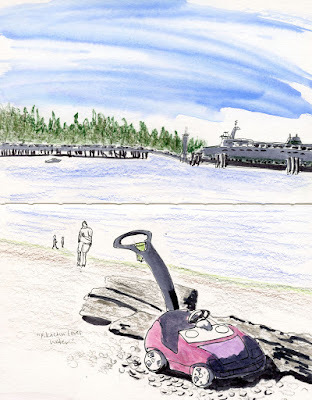 Full of boats, aged-but-still-useful technology and a fish ladder for salmon, the Locks are a quintessential Seattle experience, especially in the summer. An old-time jazz band with vocalist were giving a 4th of July concert in the park, so we stopped for a few minutes to enjoy the music. Usually if we’re entertaining guests, I try to restrain myself from taking time to sketch, so I jumped at this opportunity for a quick one. Yesterday the farmers market sketch I showed was about values on toned paper. 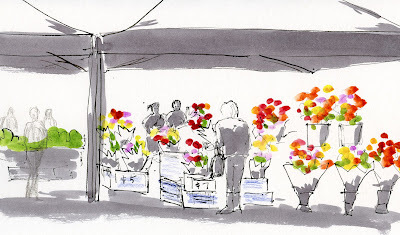 Today it’s all about color – two sketches of flower vendors at markets in June. 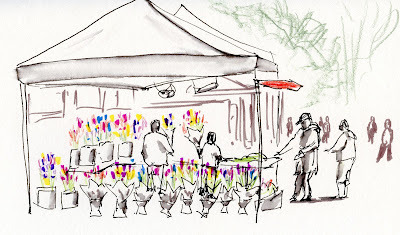 Usually by this time of year my market sketches would be of buskers, my favorite summer sketching subject. I’m not sure if I’m going at the wrong times or to the wrong markets, but I haven’t seen any besides PK Dwyer. It’s been a great season for strawberries and early peaches; I hope it’s not a bad season for buskers.